This attractive point-of-purchase counter display is available at NO CHARGE to our customers that sell Brother Stampcreator Stamps. 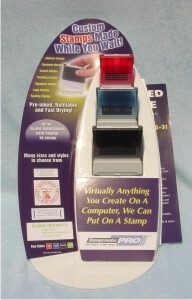 Includes sample "fake" stamps and a side holder for insertion of a Stampcreator Stamp Catalog. Shipping charges are the only cost that you will incur. Help yourself sell Brother Stamps by requesting a counter display today! Limit one per customer please.